There has been a lot of bad press about meat in the last few weeks, so I was pleased to be approached by Farmison and Co to review some of the products they sell online. 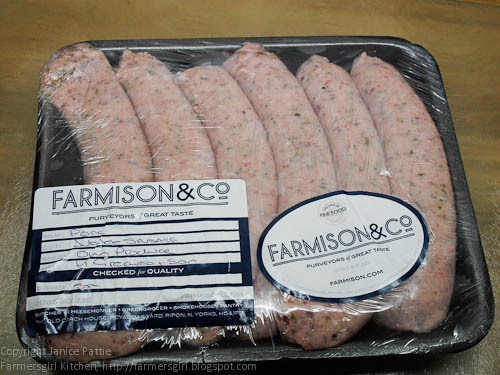 At Farmison and Co everything is driven by taste - from finding the best possible suppliers, to focusing on seasonal, predominantly British produce, to developing delivery systems which get orders out to customers at optimum quality. Farmison and Co is the brainchild of John Pallagi and Lee Simmonds; two old friends who share a love of fantastic food with real flavour and a genuine admiration for great British artisan farmers and producers. They wanted other people to experience the sort of food that they love and having previously been restaurateurs, they had the expertise and the right contacts to make it happen. So they made it their mission to create a place where people who love great tasting food could go to buy outstandingly good produce from small specialist suppliers - and the Farmison and Co website was born! With Farmison you can either choose your own cuts of meat or order one of the hampers. A monthly meat box is a good way of filling your freezer with a usable selection of meat to plan easy and delicious meals. 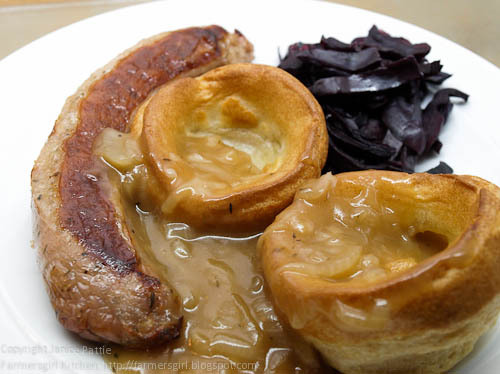 Farmison say this is a great selection of our excellent quality products in smaller portions, ideal for individual, but I found that the portions were generous and I was able to extend them to easily feed three or four people. The labelling on the Farmison products is excellent, the type of meat is clearly labelled and includes details of the breed (if appropriate) and the producer, very important with the current concerns about what we are eating and where it comes from. These Jubilee sausages are huge, a single sausage is quite enough for one person. I simply put them in my Mermaid roasting tin with a little oil and put them in the oven at 180C until they were well browned, about 30 minutes. I served a single sausage (the equivalent of two ordinary sausages) with yorkshire puddings, red cabbage and onion gravy. There were three cooked sausages left over from last night so, for lunch, I made 'pigs in blankets'. 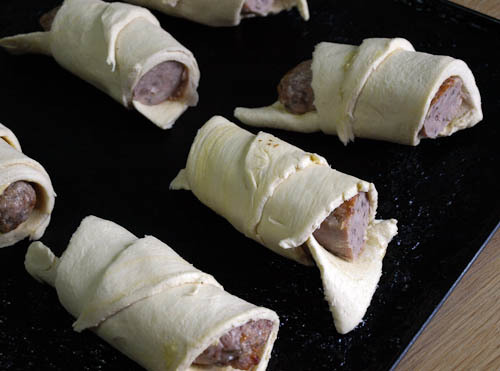 I halved the sausages, opened a can of croissant dough, spread each of the triangles of dough with a little dijon mustard, then wrapped the sausage halves in the croissant dough and baked them at 180C for 15 minutes. Both dishes went down very. 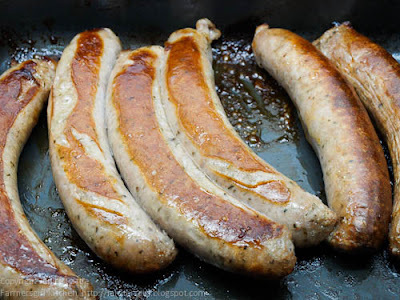 The Jubilee sausages are very meaty (76% pork) and quite highly spiced a bit more like a cumberland sausage than your pork banger.. 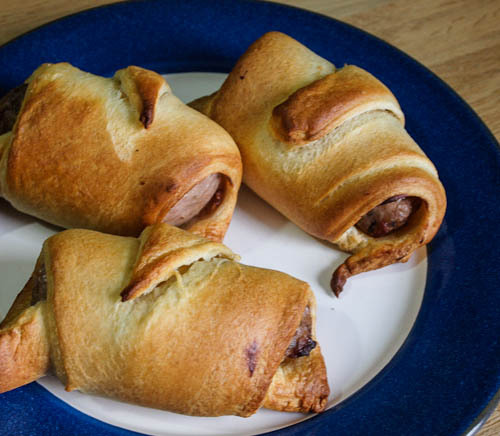 I can highly recommend the croissant trick, I had the dough in the fridge and it was nearing its sell by, but I would go out of my way to make these again, the sweetness of the croissant worked very well with the sausage. 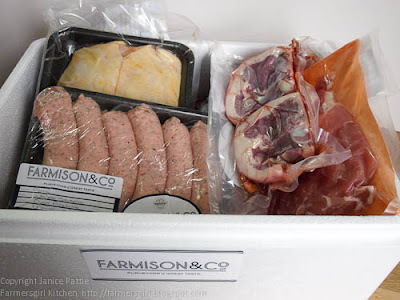 I was sent a hamper of meat products by Farmison and Co for review. I was not required to give a positive review and all opinions are my own. 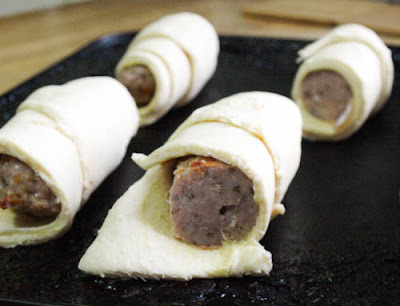 Your pigs in blankets are gorgeous!